The Laziest Cat Fight Ever! Munchkin cats are a relatively new breed of cats. They are identified by their unusually short legs. This, however is a natural genetic mutation, not manmade. There have been sightings of several short legged cats in the US and in Europe, but a captive breeding program was only introduced in the early 1990’s in the US, which led to the establishment of this breed. These cats come in four distinct sizes: Standard, Super Short, VW Microbus and Rug Hugger. They are also separated into two groups for shows: Longhaired, which has a semi-long plush coat and Shorthaired, which has a medium plush coat. The Munchkin cat is a small to medium sized cat, with abnormally short legs. This however poses no risk to its spine which is absolutely normal. Their legs may be slightly bowed. The Munchkin cats comes in all colors and patterns. The Munchkin cat is considered to be sweet-natured, playful and intelligent cat. It likes being around people and responds well to good handling. This cat is outgoing and often plays with kitty toys. They like to run and chase. They also have a tendency to sit up like a rabbit. The Munchkin cats are a happy, healthy and hardy breed of cats and so not require any specific caring measures. I like this muchkin cat, he’s cute and kinda unique in a way coz he has shorter legs among the other breed! Awesome! I have a calico munkin, and she is adorable. She loves to sit in my lap any time I sit, and she sleeps on my stomach at night(I sleep on my back). She loves to run through the house and plays with her toys. I thank God for her she loves me and I love her.She has been declawed before I got her. So I walk her on a leash and she loves it. Where did you get her? How do i get a cat like this? If you are in Australia, I know of two Munchkin breeders in the country. One is called Itty Bitty Munchkins in North Queensland and their website is ittybittykitty.net . The other is Titus Rex Munchkins in Pakenham, Victoria. I do not think they have a website, but their e-mail is “tusi@netspace.net.au”. Hope this helps! You also can look on facebook by Munchkin online! There are lots of breeders! I got a very big and cute munchkin cat. she LOVES rock songs. everytime i sing a rock themed song, she will definitely come to me and stay by my side. She is so cute! It’s like a weiner dog but it’s a weiner cat, lol! So Cute!! i have never seen a cat like that wow! i really have seen every cat but that one! 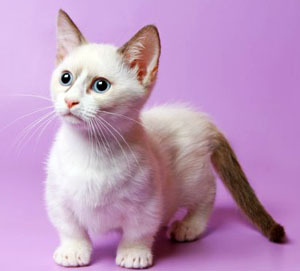 The munchkin cat looks so adorable, if there was a free one (a kitten) I’d take it right away. How friendly is your cat? Copyright © 2009-2019 Meow Cats. Cat Breeds, types of cats, all about cats. All Rights Reserved.